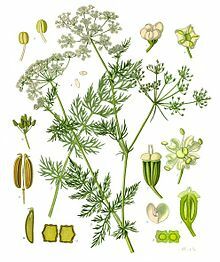 Caraway has been called by many names in different regions, with names deriving from the Latin cuminum (cumin), the Greek karon (again, cumin), which was adapted into Latin as carum (now meaning caraway), and the Sanskrit karavi, sometimes translated as “caraway”, but other times understood to mean “fennel“. S-(+)-carvone is primarily responsible for caraway’s distinct odor. Caraway is also used in desserts, liquors, casseroles, and other foods. It is also found in European cuisine. For example, it is used in caraway seed cake. The roots may be cooked as a vegetable like parsnips or carrots. Additionally, the leaves are sometimes consumed as herbs, either raw, dried, or cooked, similar to parsley. In Middle Eastern cuisine, caraway pudding, called Meghli, is a popular dessert during Ramadan. It is typically made and served in the Levant area in winter and on the occasion of having a new baby. Caraway is also added to flavor harissa, a North African chili pepper paste. In Aleppian, Syrian cuisine it is used to make the sweet scones named keleacha. In the United States, the most common use of caraway is whole as an addition to rye bread- often called seeded rye or Jewish rye bread. Caraway fruits are frequently used in Irish soda bread, along with raisins and currants. Finland supplies about 28% (2011) of the world’s caraway production. Caraway cultivation is well suited to the Finnish climate and latitudes, which ensure long hours of sunlight in the summer. This results in fruits that contain higher levels of essential oils than those produced in other main growing areas which include Canada, the Netherlands, Egypt, and central Europe. ^ a b c “Caraway”. About.com. Retrieved February 16, 2016. ^ “Anise Seed Substitute”. Buzzle.com. Retrieved February 16, 2016. ^ “English Malayalam Spice Names”. Recipes.malayali.me. 2008-11-07. Retrieved 2013-01-25. ^ “Caraway”. Word Crops Database. Retrieved February 16, 2016. ^ “Chemical Composition and Antiulcerogenic Activity of the Volatile Oil from Carum Carvi“. Archived from the original on 2014-03-04. ^ María D. López; María J. Jordán; María J. Pascual-Villalobo (2008). “Toxic compounds in essential oils of coriander, caraway and basil active against stored rice pests”. Journal of Stored Products Research. 44 (3): 273–278. doi:10.1016/j.jspr.2008.02.005. ^ “Finland a Global Leader in Caraway Exports”. Archived from the original on April 19, 2014. Retrieved April 19, 2014.